OK, fair enough. Maybe tweeting less than an hour after a cataclysmic loss isn’t the best idea, but it was understandable. 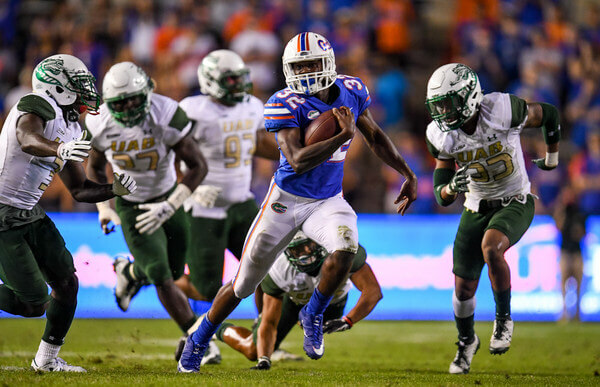 The kid is annoyed that he isn’t getting carries when he feels he should- a feeling that’s probably not logical given the presence of Jordan Scarlett, LaMical Perine and Malik Davis in that world backfield- and wants out. I can support that. But this afternoon, the Tampa Bay Times’ Matt Baker explained that Lemons had a deeper meaning behind his decision. Lemons had previously gotten in trouble soon after Mullen arrived for being caught with marijuana, and earned himself a suspension against Charleston Southern. Lemons also admitted to Baker that if Jim McElwain- who recruited and inked him in 2017- was still the coach, he would have gotten away with it completely. Instead, Mullen forced him to go to rehab for five weeks in order to remain with the program. Lemons complied, claiming that he did so as part of an effort to show Mullen that he was trying to change. …which makes it the second time in less than a full calendar year that he’s tweeted his intention to leave the Gator program on the day of a game that he suited up for. And whether or not they’ll admit it, that can’t sit well with his teammates. But at least that time he managed to limit his outburst to the internet. Per Baker, Lemons himself stated that his anger hit a breaking point in the locker room after the Kentucky loss, voicing his displeasure a “little too much” during Mullen’s postgame speech. That resulted in his ejection from the locker room, subsequent retrieval of his phone and the posting of his “I’m leaving” tweet. I’ll wish him the best, too. I know he wanted to be a Florida Gator, and I appreciate the fact that he gave his best efforts. I sincerely wish him well in his efforts to grow and improve as a human being. I do, however, can’t help but feel that his departure will benefit both parties significantly. And given the current state of Gator football, I’m all for anything that benefits it in any manner or degree. Good article. I agree, him leaving helps both parties. Good luck, Lemons, go to the ACC, just not FSU.